I decided tonight that I would really like to try to post here at least once a day with some sort of original content. It might just be a cell phone shot of how the car sits that day, but I think it would be good for me to post at least one pic related to the car per day if I can. Let’s see how long I make it! lol. 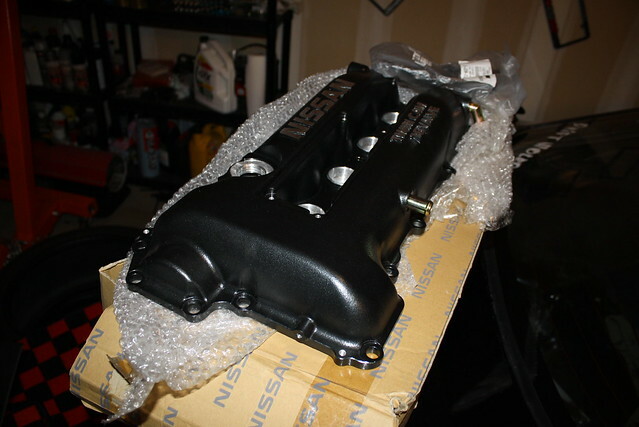 I got a couple of goodies today from my good friend Russell at NissanParts.cc. Russell gave me a great deal on some parts from his personal collection- so stoked! Thanks again for hooking me up, man. I am going to have my good friend Mike help me with the welding and cutting to convert the front of the valve cover to S13 spec. I’ll probably switch between coil pack covers from time to time- I think both are discontinued, so I couldn’t pass on either of them. I am thinking about shaving the letters off of the cover, but I am currently undecided. I will be running -8 or -10 AN fittings to a catch can, but I haven’t decided which one yet. As for the color, I think I am going to stick with wrinkle red- it compliments the red interior items really well. We’ll see though! Feel free to let me know what you think would look cool. I’ll be sure to install some new shiny hardware to bolt it in as well. Thanks for reading! Don’t shave the valve cover! May I ask why you needed a new valve cover? 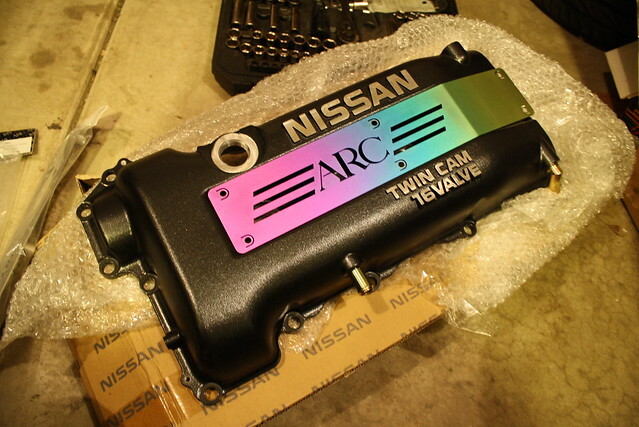 This valve cover is from the S14 and S15 SR20. It has an additional vent port and an improved design to help prevent blowby over the S13 cover. So, by cutting the front of the S13 cover off and welding it onto the front of the S14/S15 cover, you can utilize the improved design on the S13 SR. Thanks for the reply, it’s awesome that you would go through all that trouble for something like that. Hope it works out! Love the idea. I remember one of the C’s garage guys did that same mod and came out good. Love the way your car is coming along. Inspiration for me and my 240sx hatch! damon do not shave the letter please!!!!! also -8 an is a great size, i think -10 just looks soo big! please update us every single day!!!! -8 was the original plan. We’ll see! Thanks for the feedback, man. Not that it matters to you now man but touge factory is selling the 13.4 pre welded and all that. All you have to do is send them both valve covers. Just so you know! Keep it up! 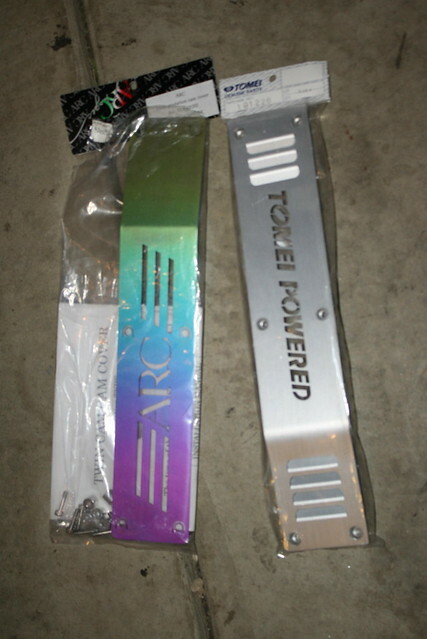 Powdercoating is included in the price as well. Thanks for passing that along! I know that MA Motorsports offers the service too, but my friend and I should be able to do it for a little bit cheaper. It’s fun to try to figure stuff like this out if I can, but that seems like a great option too! nice stuff.. use the ARC! Its rainbow color..
Nice pickup on the coilpack covers! I can’t recall seeing too many of the ARC items before. I think the red wrinkle coat ( with Nissan lettering) matched with the ARC or Tomei covers would look great!